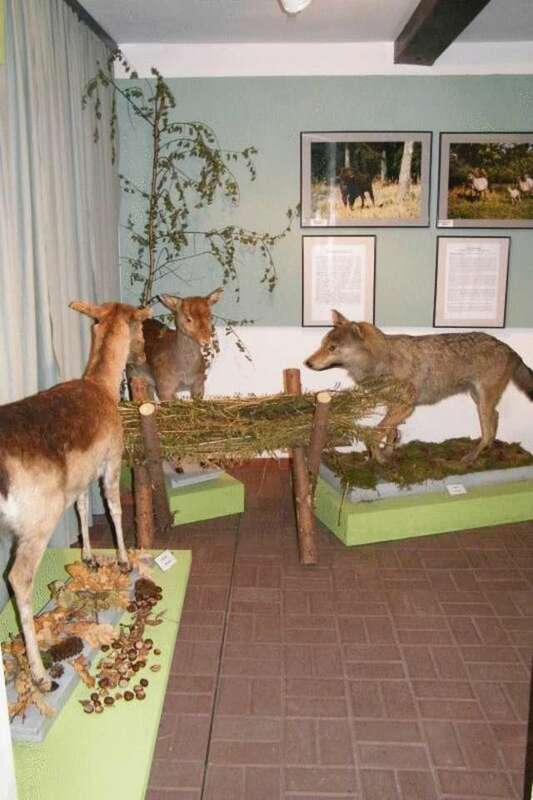 Exhibition: "The Animal World of the Masuria Lake District"
The Mrągowo area is very rich in terms of natural beauty, which is supported by the presence of many lakes, extensive forests, as well as diverse agricultural areas. Here, it is still easy to encounter a white stork or the cormorant. The past twenty years have seen an increase in the population of: the white-tailed eagle, the otter and the beaver. The fragment of the Pisz Forest lying within the limits of the Mrągowo poviat is the permanent refuge of wolves – the largest predators of Warmia and Masuria. The exhibition "We become familiar with our animals" familiarizes the selected animal species from the vicinity of Mrągowo. There, you can see both common and rare representatives of our fauna, among others, the aforementioned white stork, white-tailed eagle, wolf, otter, beaver, but also a magpie, rook, hare (which is a rarity nowadays), or the little known fallow deer. The exhibition is complemented by colour photographs of the animals of Warmia and Masuria. The exhibition is primarily targeted at preschoolers and elementary school students.